The name COLTERRIS was derived by combining a three letter abbreviation of Colorado “Col” with the Latin word “terris” meaning from the land. “COLTERRIS – from the Colorado land”. All COLTERRIS Wines are produced from 100% Colorado grapes grown in our estate vineyards in the Grand Valley AVA. COLTERRIS is located in Palisade on Colorado’s beautiful and picturesque Western Slope. The Grand Valley AVA produces world class wine grapes high in quality and distinction. 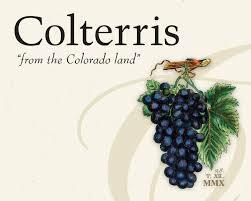 The favorable eco-climate of Theresa’s Vineyard, volcanic soils of the Grand Mesa and the waters of the mighty Colorado River contribute to the rich color, intense fruit flavors and characteristics that make Colterris wines unique. We invite you to visit us year-round at our Colterris Winery Tasting Room and seasonally at our Colterris at the Overlook Tasting Room. Also, open June-August, our High Country Orchards Country Store is the best place to treat yourself to fresh tree-ripened Palisade Peaches!